It's true what they say; kids grow up so fast. Like, crazy fast. Too fast. Between Cael and Adler, we've been hitting milestones left and right, but neither of them have brought on my latest bout of nostalgia. No, that honor belongs to Graham, who seems to have made the transition from innocent four year-old to hormonal teenager in record time. It all started with "The Sandlot". 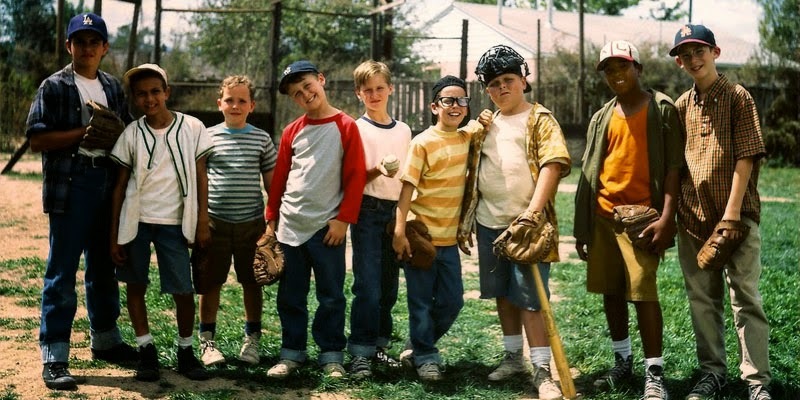 We introduced the boys to the classic because they love baseball, and because, well, this is America, and "The Sandlot" is the quintessential American boy movie. We knew we'd probably endure a few weeks of movie quoting, but it seemed a small price to pay. And with our basement inaccessible, the main television is in the living room/kitchen area, where I could watch as well. As I expected, Cael liked the movie, watched it a couple of times, and moved on to whatever cartoons had been recorded. But after about a week, I noticed something unusual happening with Graham. While Cael was busy with other things, Graham would start the movie from the beginning and watch until the pool scene. Graham thought the kiss was really funny, and at first we all agreed. He giggled and hit the "back" button on the remote to rewind ten seconds, and watched it again. We laughed some more and went on with our lives. All of us but Graham, that is. As I made dinner several nights later, I noticed that I was hearing the same music repeating, and when I looked up I saw that he was watching the kissing scene over... and over... and over again. I chuckled and blew it off until I caught the same thing happening the next day. And the next. Perhaps we are better off keeping the baseball in the backyard.